Fact Check: Could Jeb Bush Really Grow GDP At 4 Percent? It's Hard To See How : It's All Politics The Republican candidate says he can create 4 percent GDP growth as president, but there's little evidence that a president really can cause that kind of growth alone. Jeb thinks he can grow the economy at a 4 percent rate. That sounds nice, but it's unlikely to happen. 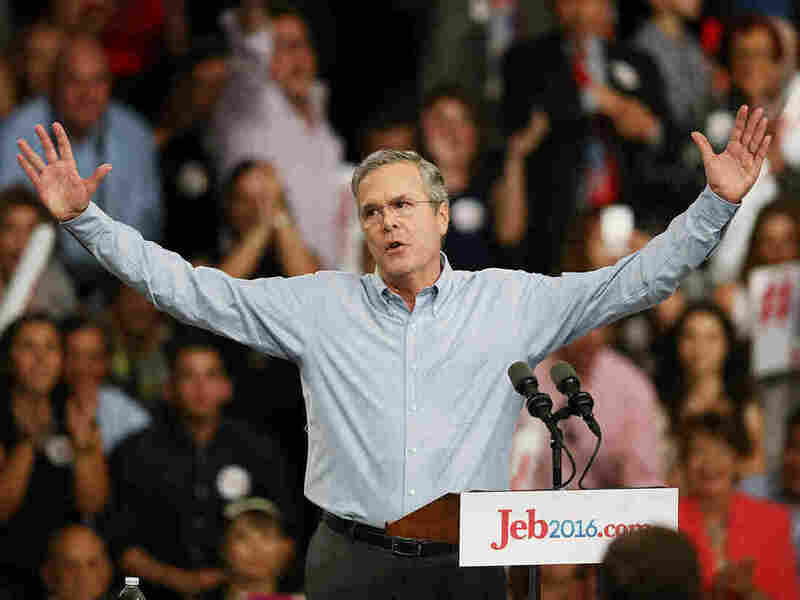 Jeb Bush's presidential candidacy announcement this week, after months of campaigning, came as no surprise. One small surprise that did pop up in his remarks, however, was a lofty goal he has set for himself as president — to grow the economy at a 4 percent rate if he's elected. He expounded on the claim Wednesday in Iowa. "To grow at 4 percent, we have to have a better workforce," Bush said. "We have to have a better-educated population, we have to embrace our energy future, we have to reform our taxes and deal with our regulation." He added that power should be shifted from Washington, D.C., and called for "lower tax rates, eliminat[ing] as many deductions, bring[ing] back common sense, shift[ing] power back to communities and states so that we can grow at a rate where median income in Washington, Iowa, is growing and maybe median income in Washington, D.C., starts to shrink. That's what I think we need to do." To the average Jane or Joe casually listening to his speech or hearing his follow-up in Iowa, it might sound like just another campaign claim. If you do pay attention to economics, you know that it's ambitious, to say the least. But can he do it? The answer: Sustained 4 percent growth seems unlikely, and, either way, it's not something the president really can control — despite the credit and blame he receives. How realistic is it, exactly? Let's start by putting the ambitiousness of Bush's promise into perspective. Sustained growth over 4 percent doesn't happen all that often these days. Here's how economic growth has looked since 1980, just before Ronald Reagan became president. This is annual average gross domestic product, or GDP, growth. 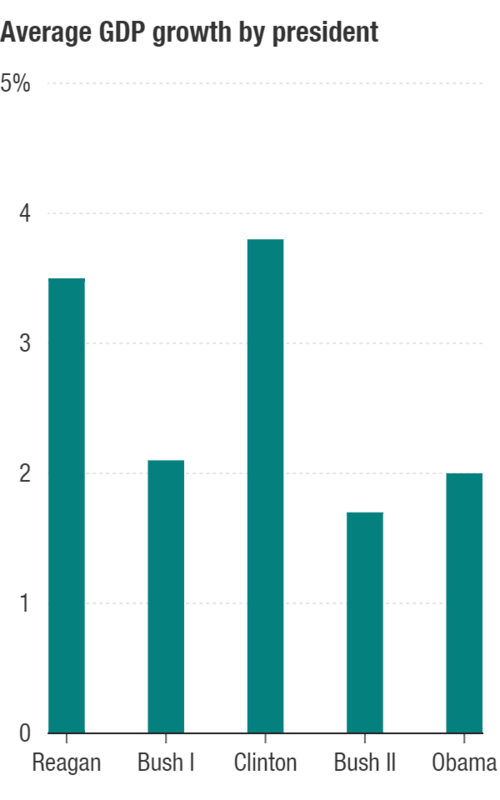 The actual, quarter-by-quarter data are a bit noisier, and growth does leap above 4 percent every so often. But the only time in the past 25 years it has hung out above 4 percent for any extended period was in the mid-1990s. So one way to look at this is to say that if Bush wants to look to anyone for guidance, it might be early-term Reagan or Bill Clinton. Since 1980, Clinton's years came the closest, but they were just shy of the 4 percent mark on average — closer to 3.8 percent, to be exact. Reagan was next at about 3.5 percent growth, followed by George H.W. Bush, who was slightly above 2 percent. Obama comes in just below 2 percent, and George W. Bush is behind him, at around 1.7 percent. The next question is whether Clinton (or any of the recent U.S. presidents) can actually be held responsible for the economic growth on their watches. Presidential candidates make promises all the time about how they can transform the economy. Back in 2011, for example, GOP presidential hopeful and Minnesota Gov. Tim Pawlenty promised to achieve economic growth of 5 percent. 2. A lot of that appears to be luck. Economic growth under Democrats, it turns out, has on average been 1.8 percentage points higher than under Republicans. That's a pretty huge gap. But from what they could ascertain from the theories they tested, it doesn't appear to be Democratic presidents' doing. "Democrats would no doubt like to attribute the large D-R growth gap to macroeconomic policy choices, but the data do not support such a claim," they write. "It seems we must look instead to several variables that are mostly 'good luck,' with perhaps a touch of 'good policy.' "
Democrats, they write, have presided over better productivity shocks — think improvements in technology that boost the economy, like the Internet boom — better international conditions and better consumer expectations. Presidents would be hard-pressed to say they created large-scale technological change, a better global economic environment or, the researchers find, better consumer confidence. Presidents do have a little control, of course — sharp oil price spikes and dips are one of the factors that Blinder and Watson found to affect growth, and foreign policy decisions in places like the Middle East can affect those. But amid a huge mix of factors, this is only one small part of the many forces affecting the economy. Not only that, but they also ruled out the idea that presidents set each other up for growth. That is, it's not that George H.W. Bush's policies set the stage for Clinton's booming economy (or that Carter set the stage for Reagan). More important, the factors Blinder and Watson studied only explain around half of the gap. The rest remains "a mystery," they write. That means there could be something about presidents that Blinder and Watson didn't investigate that could allow Bush (or any president) to boost growth to 4 percent, theoretically. But given the current economic landscape, that seems unlikely. The bottom line here is that 4 percent economic growth is maybe possible, but it seems highly unlikely. And it's certainly highly unlikely that any politician can promise a set of policies that would definitively set the economy on that kind of growth course. For one thing, no one foresees anything approaching 4 percent growth in the next few years. The Federal Reserve's interest rate decision-makers, for example, mostly see GDP growth staying at or below 3 percent in the next few year and in the long run at just over 2 percent. Not only that, but consider where the economy will be when the next president takes office. "If you look at what we believe will be the state of the economy in November of 2016, which is pretty close to full employment, predicting above-trend growth would be hazardous," said Blinder, who also served on President Clinton's Council of Economic Advisers. "To say you're going to do 4 percent per year for four years when the trend is only 2 is making a claim, I think, almost anybody would find outlandish." Even if Bush (or any candidate) does happen to have a package of policies that could create gangbusters economic growth, the other thing a president needs is a Congress to enact those policies. Even so, it's tough to see what those policies might be. "I would say there's probably nothing that the U.S. Congress could do to raise the growth rate from 2 percent to 4 percent," Blinder said. "And there's even less that the president could do under the Constitution."